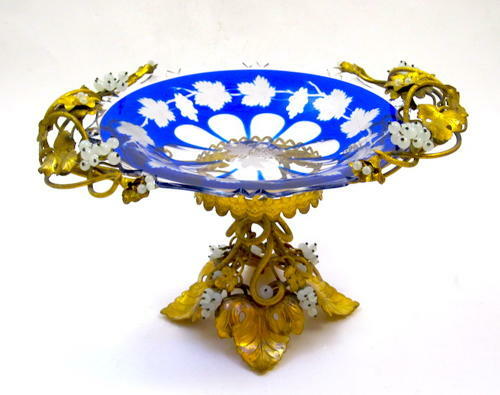 Antique Blue and Clear Overlay Glass Bowl Tazza Bowl with Very Fine Dore Bronze Mounts Undulating Round the Rim and White Opaline Baubles in the Shape of Grapes. The Centre of the Dish Finely Engraved with Vine Leaves and Grapes. The Base also Decorated with Fine Dore Bronze Mounts in the Shape of Leaves and Opaline Glass Baubles in the Shape of Grapes.